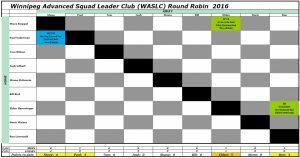 Note that the Round Robin results (below) do not reflect Steve and Josh’s game. To be updated in the future. ♦ The white boxes in your row indicate your “home” games, your column indicates your “away” games. ♦ You get to pick the scenario and rule set (full ASL, or ASLSK) in all your home games. ♦ For home games, you can reasonably expect your opponent to come to your home, or a reasonable venue of your choice (but please be accommodating). ♦ The 4 players with the most points will play off for the trophy (it’s a fine trophy with a long history). ♦ The cut off date for submitting ladder game results is December 31st at the stroke of midnight. Any submissions after that date will go instead to the 2017 Ladder results. ♦ The Laddermeister will post a list of the finalists with their rankings on New Years day. ♦ Scenarios for the playoff rounds on the days of the Finals are supplied by the Laddermeister, using the CASLO approach to scenario and side selection. ♦ In the playoffs, it will be 1 vs. 4, and 2 vs. 3 (adjusted for availability) in the morning round, and then the winners will play off in the afternoon/evening round for the trophy.